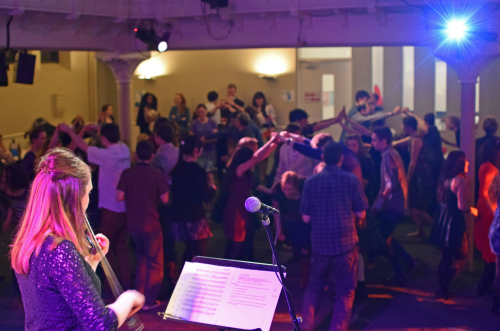 I danced and took photos (not simultaneously) at the King's Church ceilidh. Of the many, many things that have been written about Stephen Fry's rant at God, I've chosen just three for you. Krish Kandiah and Pete Greig follow Proverbs' advice that "A gentle answer turns away wrath" (15:1). Tim Stanley is rather more caustic. My main thought on the whole thing (apart from wondering why I didn't join in all the writing) is pleasure that British Christians have responded eloquently and confidently, which would not not always have been the case. When Revelation 21:1 says that there will be no more sea, is that really what it means? Dennis Johnson explains why there's hope for surfers in the goodness to come. With some very strong language at the end, Nick Cohen argues that politically correct censorship defeats itself. The magic in manure is explored by Richard Fortey. Steve Tibbert gives a church leader's perspective on how to handle money.